Madness Petunias have large 3 inch blooms that can be rather fragrant. They have a compact habit and are tolerant of the weather. 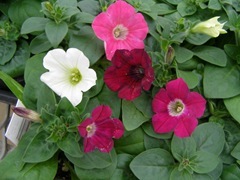 Petunias have trumpet-shaped flowers that are 2 to 3 inches across. They come in a wide variety of bright colors. Madness Merlot Mix has shades of pink and burgundy with some white as accent. Petunias do well from early spring until late fall. In the Fall, Petunias are excellent plants to fill in when you have to replace your summer plants in early September when it is still too warm for Pansies. 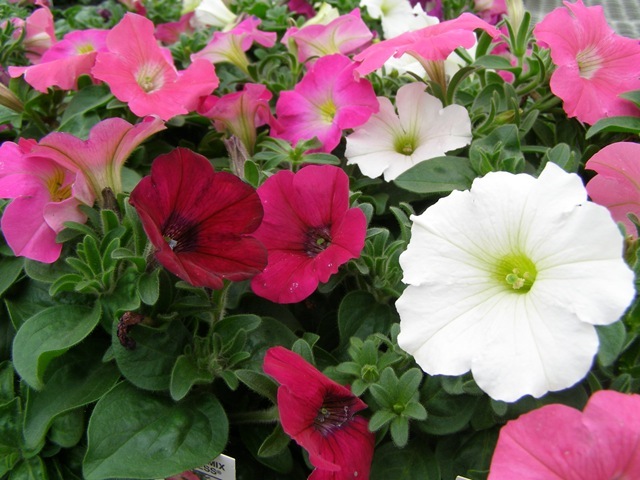 Petunias are able to handle the warmer weather of late summer/early fall and the cooler weather of mid- to late fall. They will survive light frosts, but the blooms will turn brown. A hard frost will kill most varieties of petunias. Varieties and Colors: Merlot Mix – We no longer grow this item in the fall, but check for it in the spring. Recommended Spacing: Plant 6” to 8” apart. Height: Grows 10″ to 14″ tall. Outstanding Features: Very easy to grow and some varieties are fragrant. Tips: Plants can be pinched after the initial flowering to maintain bushiness and promote new flower growth, or they can be left unpinched to grow naturally.